Through the years, prior to boarding a flight at various airports around the world, we’ve been fortunate enough to try out a bunch of the different airport lounges. Some have been fantastic, with terrific relaxing spaces and gourmet food and drinks to satisfy anything you may need to settle your stomach before you take off. And others have been downright disappointing, so much so that my husband and I have walked out of the lounge in favor of just going to wait at the gate for our flight instead of being uncomfortable at a terrible airport lounge. 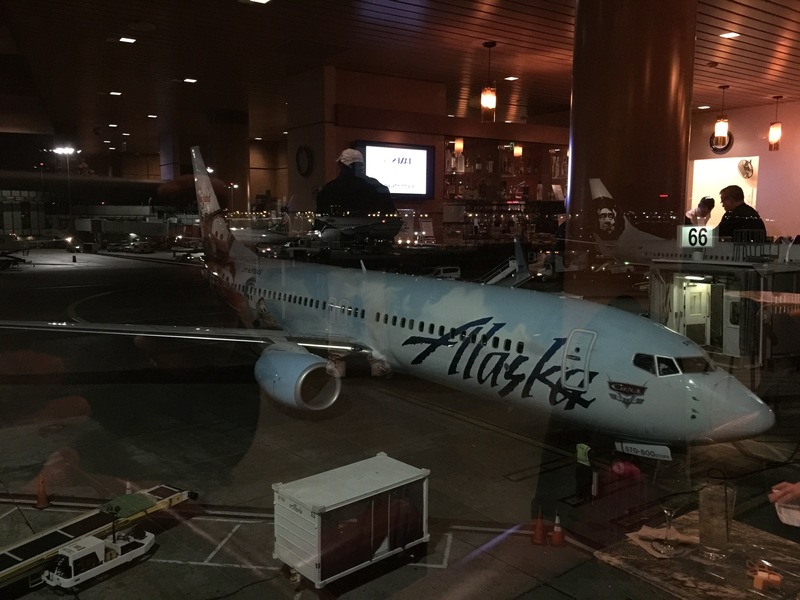 Last fall, before our red eye flight from Los Angeles to Baltimore on our Alaska Airlines flight, we had the chance for the first time to visit the Alaska Airlines Board Room at LAX. Before our trip to the Alaska Airlines Board Room, my parents actually had the pleasure of visiting the Board Room many months before when they took an Alaska Airlines flight. Both my parents had raved about how much they enjoyed the Board Room and how nice it was. So, I was quite curious as to how my husband and I would like the Board Room. Of course, one of the things I really wanted to try out, wasn’t operational in the evening hours. The famous pancake machine. 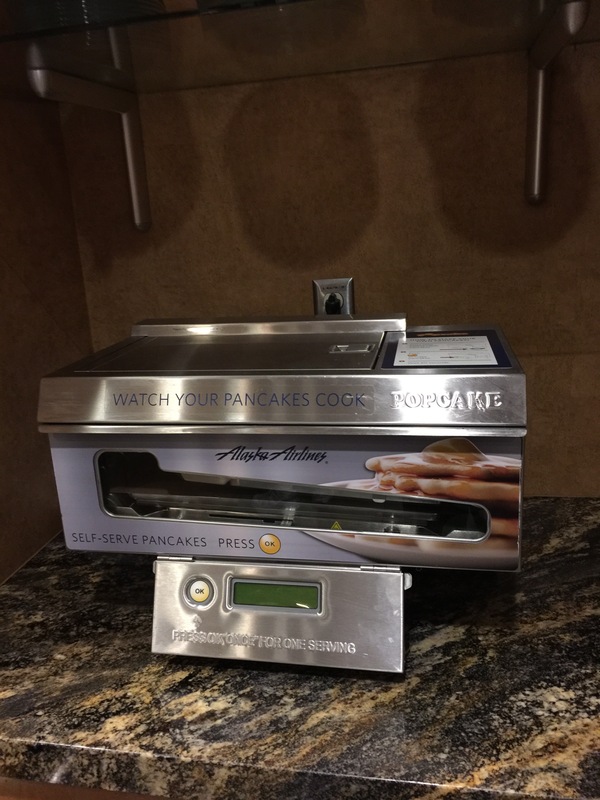 Many travelers talk of the virtues of Alaska Airlines Board Room’s terrific pancake machine, which I guess must only be operational during the morning hours? For our late night red-eye flight, while the pancake machine was out on the counter, there was a sign stating that the machine wasn’t working. I was kind of bummed. Doesn’t everyone eat pancakes 24/7? The board room was nice and spacious with plenty of tabletop seating, comfortable couch seating, and a bar with bar seats as well. The bar was quite popular at this late night hour. 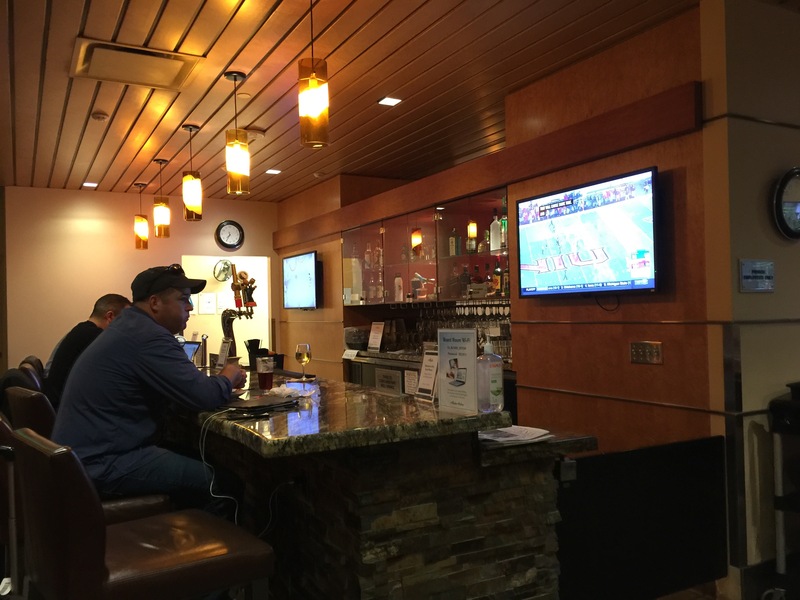 With each guest to the Board Room being given 2 free drinks per visit, many guests made use of this perk to grab a draught beer or a glass of wine to get them through their red-eye flights. 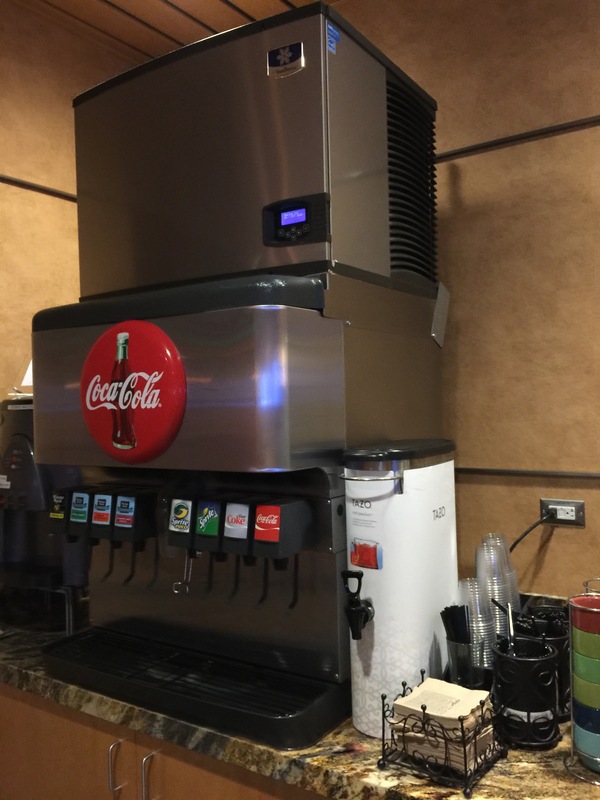 For those who aren’t alcohol drinkers, or who just aren’t looking for a night cap, there’s a soda fountain with all of your favorite Coke products as well as some fruit juice and even ice tea too. 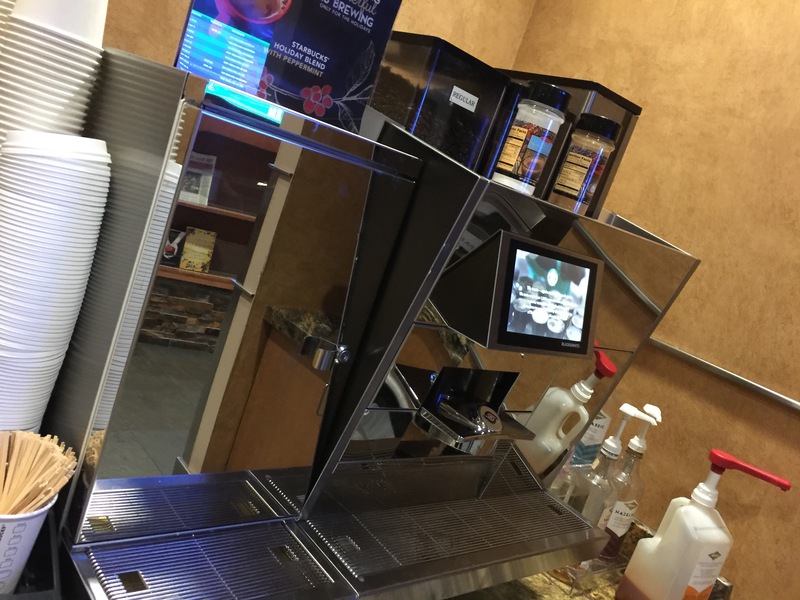 And for those who want a little pick-me-up in the evening with a hit of caffeine, there’s a fancy coffee machine that can make lattes and espressos and cappuccinos. They even had a few bottles of flavored syrup such as vanilla and hazelnut as well to help customize your drink. And of course, there was straight up fresh brewed Starbuck’s coffee as to enjoy as well. As far as food, there was a small selection of food, but not really enough to say that you could fill up before your flight. There was an offering of soup – hearty vegetable beef soup – and crackers and some fresh fruit laid out on the counters – bananas, oranges and apples. In the small little refrigerator, there were some salad fixings and some cheese cubes to go with the crackers on the counter. Cubed cheddar cheese and cubed Monterey Jack cheese were really all I needed to keep me happy. Surprisingly, my husband decided to grab a plate of salad. The salad greens were a mix of baby kale and spring mix with shredded carrots, mandarin orange slices and cherry tomatoes. Crunchy wontons were an option for a tasty topping for the salad. Sesame dressing, ranch and light Italian were the available salad dressings. 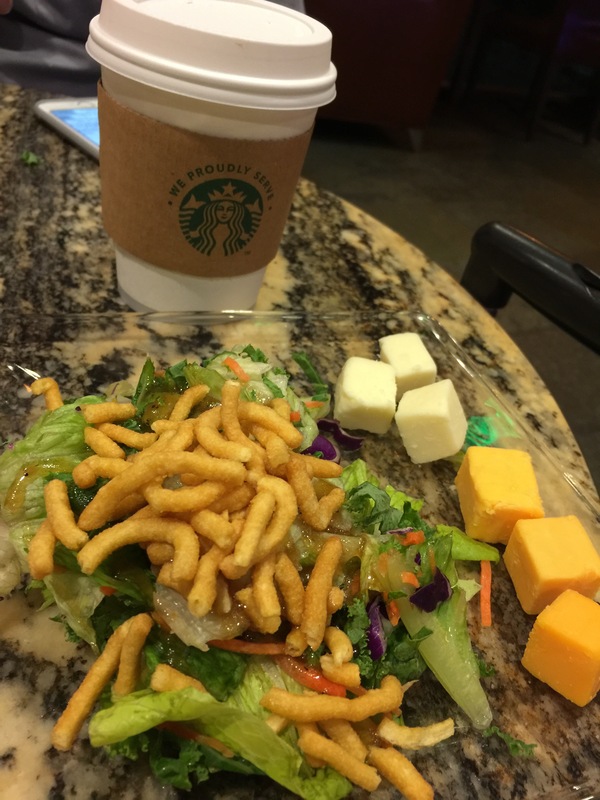 After my husband had a plate of salad, he told me I needed to go and get salad because it was so good. Now, this is my husband who can eat a salad, but would probably prefer not to have as much of those healthy, green, leafy things. And yet, he’s telling me I should have salad? That salad must have been something for him to tell me I needed some of that. I’ll admit, for salad, it was pretty tasty. And it was pretty darn filing for a light dinner meal. 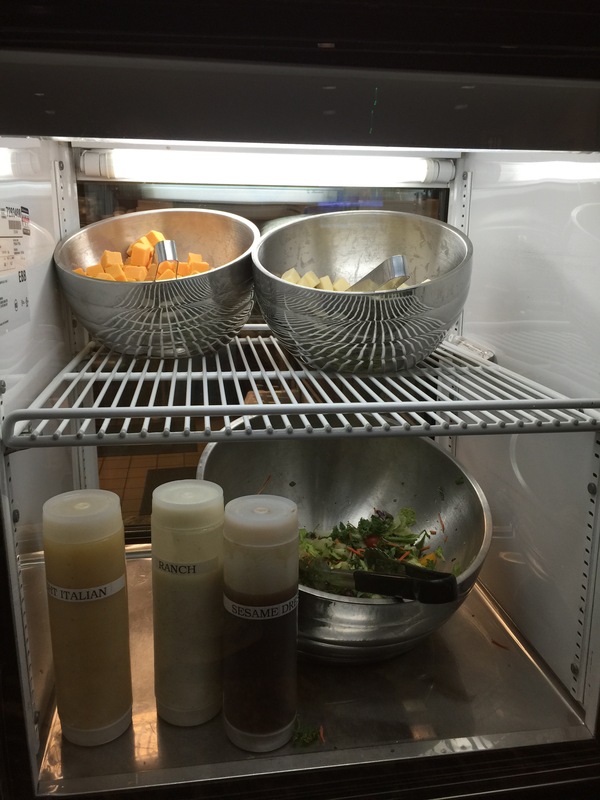 For those who wanted more than just soup and salad, entrees could be ordered from the kitchen for a nominal fee. Pizza, grilled salmon and chicken entrees were offered. We actually saw quite a few people in the lounge taking advantage of ordering entrees that looked pretty tasty. 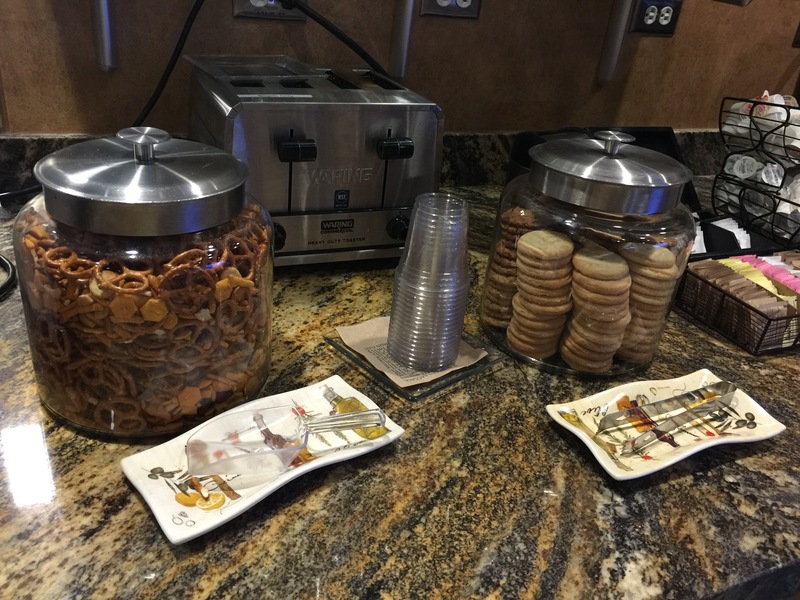 For some quick bites, there was some bar bite party mix and a container of cookies including sugar and chocolate chip. I certainly took advantage of some of those chocolate chip cookies, and they were nice and soft and chewy. Our overall impression of the Alaska Airlines Board Room was generally a good one. The lounge was nice and comfortable with plenty of seating and arranged in a way that the vibe was just relaxed and laid back. While the food and drink offering wasn’t off the charts, they had some great choices, including that terrific salad, and just enough food to keep us all satisfied. 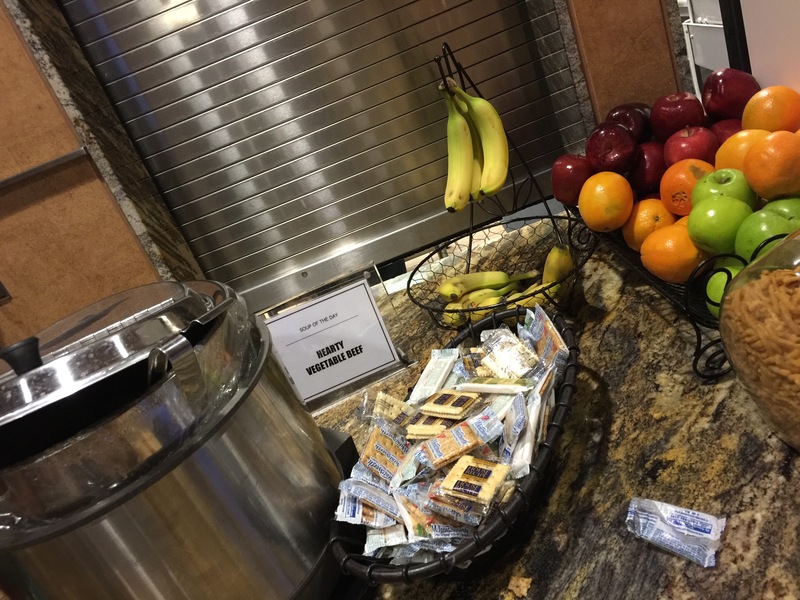 When comparing our experience with the Alaska Airlines Board Room versus some of the other airline lounges we’ve used in the past, this one ranks pretty high up on the list of lounges. 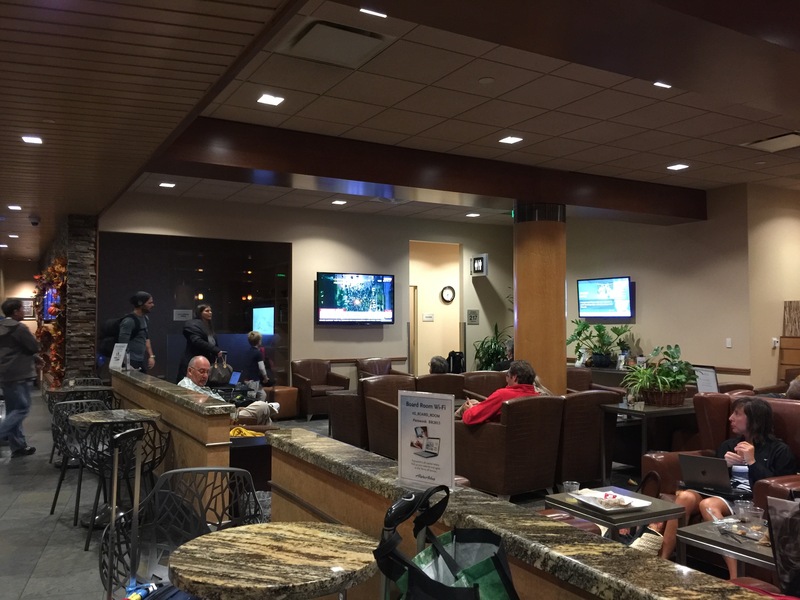 In fact, by the time this blog post publishes, my husband and I will have used the Alaska Airlines Board Room again, and we are very much looking forward to that particular visit.